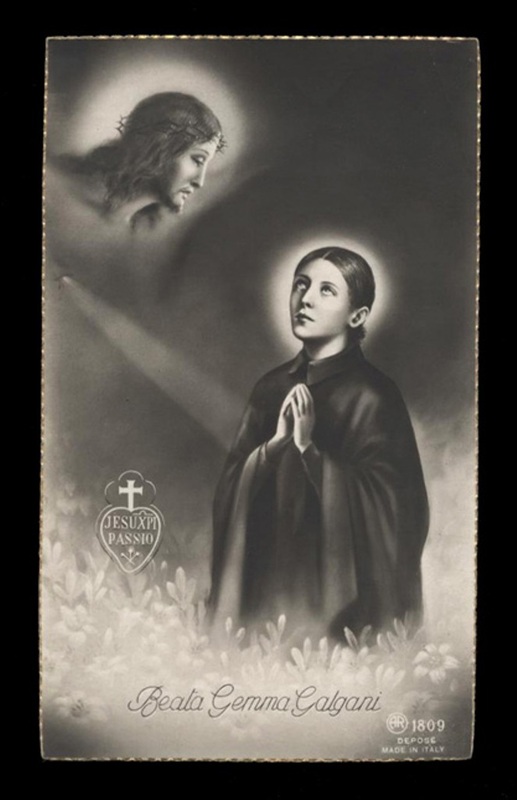 St Gemma suffering in union with Jesus: Meditation on the Passion. Source for this article is from the Italian book "La Povera Gemma" written by Padre Enrico Zoffoli C.P., published in 1957. 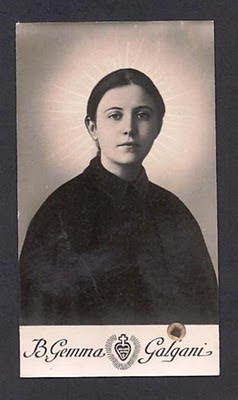 The book is a 1014 page hagiography on the life of St Gemma. The webmaster would like to extend a heartfelt thank you to Mrs. Rita Dunn for translating these pages into English for this website. May God bless her for her efforts. “La Povera Gemma” Padre Enrico Zoffoli C.P. Chap. III “OBEDIENT UNTO DEATH"
"Pilatus autem volens populo satisfacere, dimisis illis Barabbas, et tradidit Jesum flagellis caesum ut crugificeretur". With a sense of indefinable veneration and astonishment we find now “the poor Gemma" in one of those stages [of the spiritual life, translator] in which that mysterious violence of 'love' so wounded her spirit to the point of causing the outpouring of blood from her body. We believe that our objective serenity with which we should proceed [in our study] is fully reconcilable with the emotions we feel as we begin to examine the complexity of phenomena and mystic experiences of undisputed supernatural origin. ["The little poor", St Francis of Assisi]. In Gemma's physical martyrdom we recognize the sign of her unequivocal and prodigious mission as "victim". This [mission of victim] probably started to be revealed in the subtle purification that predisposed Miss Galgani to reach the full union of love with her crucified Spouse. The redemptive influences in her soul coming from her sorrowful ecstasies were never less intense than the purifying influences. During those sublime moments [these influences] must have been so efficacious as to enable the saint to celebrate her spiritual espousal while still very young...(83). The reader will be able later to judge by himself the truth of these conclusions. "It is true - said Mrs. Giannini - that we are all fruits of the Redemptive Passion but it must have been that Gemma did not want to say that she was called to be a privileged fruit in the participation of the Sorrows of the Passion, as I have previously reported. in Paradise to whom I have given a taste of all my Sorrows, like I have given to you!'" 84. Facts prove the above locution. We will document these facts following the progression of the narrative in the Gospel. -Is it not the same Passion in which in the course of centuries the Head reached out to His members? The Gospel is history and prophecy. “Being in Agony, His Sweat Became as Drops of Blood ..."
During an ecstasy Mr. Matteo Giannini said that Gemma : "seemed to have a drop of blood coming from each hair. It was real blood. I saw the blood stained cloths with which my sister [Cecilia] was drying her with and that they were then put into the laundry. Palmira Valentini one day encountered Gemma and saw her "all full of blood on the temples and forehead". ‘Gemma’ - asked the friend – ‘what did you do?’. Mrs. Giustina testified: "I saw blood all around her head and forehead, between her hair and I think even from her eyes" (87). 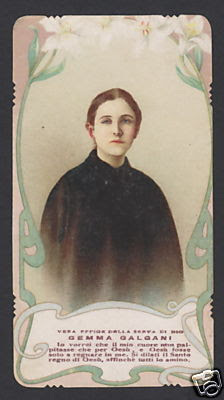 The humble maid [of the Giannini home], Mrs. Zeffira Pracchia, testified to have washed "Many times Gemma's shirts, cuffs, bed linens and pillowcases. They were blood stained"
Very concerned about this, she talked about it with the [Giannini] family. However, she did not want to say anything to Mrs. Cecilia because she was afraid that she would reprimand Miss Galgani. (91). Lawyer Giuseppe Giannini on one Good Friday saw: "a circle of blood around her head and some drops were flowing from the temples. It was exuding from her skin. I did not touch it. My aunt was drying her with some white cloths that became stained with real red blood. The blood then began flowing again and it was a real bloody sweat. D. Father Lorenzo Agrimonti also saw it and remained vividly impressed. He wrote a long and detailed report in which he describes the sequence of the event that he himself witnessed from Sept. 1st to Sept 7th, 1899. (93). Cecilia Giannini is the most informed and precise witness: “I saw the bloody sweat from her face and hair. I imagine that it was the same on other parts of her body. I saw this three or four times. The sweat I saw was not clotted blood but fresh blood, and it was dropping to the ground. While this was happening she was in ecstasy and kneeling. Her suffering was real and enormous. Gemma's entire body was under the irresistible pressure from the agony of her spirit in Communion with the agonizing Christ at the sight of the sins of the world. It has been demonstrated that such phenomena is not above the law of human physiology, since it has been verified in subjects endowed with acute sensibility and those having vivid sorrowful emotions. However in the Saints - as in Our Saviour - what is more astonishing is that the 'cause' of it can only be supernatural. "…..Then Pilate Took Jesus and had Him Scourged.."
Gemma also suffered the torture of the flagellation. The wounds provoked by the lashes were horrifying just as the wounds of the Stigmata (most properly called) that we will discuss later. "In regard to the pain of the flagellation - declares Eufemia Giannini- it lasted for four consecutive Fridays in March 1901. However, I saw her in this way only on the first Friday. She was laying in bed in ecstasy. We lifted the bed covers starting from her feet and I saw her legs up to her knees. The legs were covered by long red stripes, 2cm wide [about 3/4 of an inch] and the length was 15 to 20 cm. [about 6 to 8 inches]. The blood was under the skin exactly as it would appear after a lash, leaving a red stripe. I heard that on each consecutive Fridays, her skin was lacerated more and more; so much that on the last Friday they were very deep wounds, but I did not see them…”(98). "One evening I saw that she was in pain and she went to bed earlier than usual, so I was vigilant in case she felt sick. I was not thinking about supernatural things." Cecilia noted that at that time the saint did not have anything [unusual ] happen in many weeks. The deposition made by Cecilia during the “Information Process” in Lucca is even more detailed. “On another occasion I saw that she was suffering more that usual... I went close to her and I was attentively looking at her and I saw that every once in a while she was... trembling. I took her hand and I saw on her arm red stripes.."
the skin is lacerated? Also, when it was all over she would thank Jesus. I noted also that when she was suffering she spoke very little." (102). "…Having Twisted a Crown of Thorns, they Placed it on His Head"
For Miss Galgani, this nuptial ceremony was not just a symbol. Many times she would feel the hard thorns that would make her spasm in atrocious pain. She hints at this in her Diary when she writes about her ecstasies. However for the scientific severity of our research we gladly return to the depositions of the eyewitnesses. "One time” - confirms his daughter Eufemia – “I saw in the middle of her forehead close to the hair line a triangular wound that was well distinguished that remained there for some time. But I do not know what it was". "One time I saw on Gemma's forehead a drop of blood : perhaps it may have been from the crown of thorns". ".....Also last Friday”- writes Mrs. Cecilia to Fr. Germano - blood was coming from her head as each single hair had a drop of blood, and some blood fell on the floor.."
"On one Thursday Jesus gave her a crown of thorns and He pressed it on her head causing many small fountains of blood that flowed over her face and over the pillowcases. Thus she suffered for one hour; then Jesus blessed her...". under those ribs,….but what was it?" Eufemia [Giannini] explains: "together with the flagellation there was also the coronation. I saw her like this one evening and I became frightened. She was in bed and I could see only her head. Blood was flowing in drops from her forehead and from her eyes like two tears that were congealing. Also, from her nose two rivulets descended to under her neck, forming there a small pool of blood." "She seemed dying; her face was pallid; eyes and mouth were slightly open. She seemed like Jesus in front of Pilate when he paraded Him to the crowd saying:"Ecce Homo!". I could hear a fatigued breath united to a feeble moan." This same dolorous image was witnessed also by Mrs. Cecilia. "And Taking His Own Cross He Went out to The Place of The Skull"
Such a Passioned lover of Jesus, Gemma knew by experience what it meant to follow Him on the way of His immolation. She knew this for real and not only metaphorically. She carried her cross. We do not lack testimonies [on this] and according to them the saint had a wound on her right shoulder, as is mentioned concerning other mystics. "It was very large and deep” - writes Fr. Germano – “and it would cause such a great pain to her as to make her walk bent on that side. She retired like all other Friday evenings and till Saturday morning the wound would bleed copiously. However, the difference between Gemma and the other mystics [who experienced the shoulder wound] she would still feel the pain afterwards for quite some time". "…her shirt” - states Cecilia – “on one shoulder had a large blood stain...". "…At times to be kind, I would place my hand on her left (?)shoulder. I could see that Gemma would suffer. I heard later from my aunt that on that shoulder she had a wound. That was certainly a gift from Our Lord". "if I placed my hand on her shoulder, she would experience pain." We should not be surprised at this. We only wished that this fact would be better documented. It turns out that this wound was never seen by anyone, not even Mrs. Cecilia. However the external signs are very clear, and keeping in mind all the other phenomena of the same kind, it would seem arbitrary to argue its existence. In case that our conclusion would seem unfounded, one would have to suspect that Gemma was feigning when she felt pain on her shoulder. However, this hypothesis would seem absolutely unacceptable. Therefore the wound must have been one of the many of the flagellation, without any doubt of the distinct symbolism thus contained. Therefore the possibility of an inaccurate interpretation does not disprove the factual truth. "The Greatest Grace" of the Stigmata. These [the stigmata] have decorated the innocent flesh of our heroine. The clearest and most ample account comes from her Autobiography. We report the most significant parts of this prodigy in perfect harmony with what it is read of other great stigmatists. ".....It was evening and all of a sudden and earlier than usual I feel an interior sorrow for my sins and it was so strong that I never felt it that way; that sorrow almost caused me to die". -the interior sorrow that compels Miss Galgani into agony is rendered more intense by the infused recollection and rapture of the senses in which her soul is plunged at the same time in a loving and sorrowful prostration. Then She opened her mantle and She covered me with it." 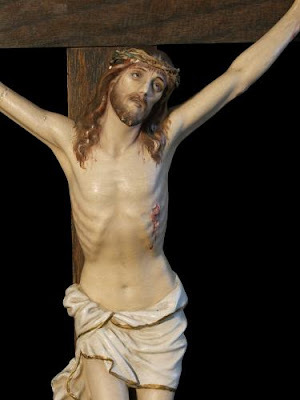 "In that instant Jesus appeared, His wounds were open but from the wounds there was no blood but like flames of fire that in an instant touched my hands, my feet and my heart. I felt like as if I was dying, but the Madonna sustained me and covered me in Her mantle. I went to bed. Those sores and those pains instead of giving me sorrow brought me a perfect peace. In the morning with difficulty I went to Communion and I donned a pair of gloves to hide my hands. I could hardly stand. Each moment I thought I could die. The pain lasted until 3pm on Friday, the solemn Feast of the Sacred Heart of Jesus. Afterwards, every Thursday about 8pm I started feeling the usual pains. While this was happening I would feel a intense sorrow for my sins. This sorrow would cause me more affliction than the pain on my hands, my feet, head and my heart. This suffering for my sins would reduce me into a state of sorrow unto death...."